Learning how to dance is a stimulated way for children to develop social abilities. They are important skills that lead your child to success both at school and throughout their lives. 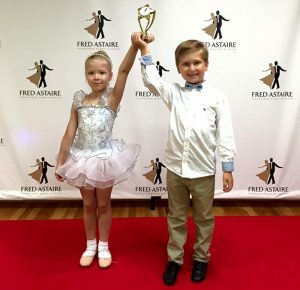 Fred Astaire Dance Studio is offering weekly group classes and private instruction for Kids. It is a great opportunity for your child to discover the divine world of Ballroom Dancing! No prior dance experience is necessary. We work closely with parents in order to develop an entertaining, productive and rewarding experience, allowing each child to progress and grow individually. Fred Astaire Dance Studio in Durham provides Group and Private dance classes for children 5 years and older. Each class focuses on Classic Ballroom such as Waltz, Tango or Foxtrot dance, as well as Latin dance. Our Certified Instructors will teach your child the basics of Partner Dancing in an entertaining way and uplifting environment. Balance, steps, musicality, posture, body language, eye contact and poise are emphasized and trained into your child from the first day of teaching. Our Dance classes are a great confidence builder and are a stepping stone towards competitive dancing as well as Dancesport. Fred Astaire Dance Studio is also specialized in competitive dancing training. We teach Children the technical aspects of ballroom dancing while training through physical strength and endurance exercises. Whether or not children are dancing with a teacher or a fellow student, each of them will be fully prepared to compete. Check out our calendar for group classes.